Reforms to make A-level maths more popular have split teachers' opinion, the government's exam watchdog says. Many teachers believed the changes have "dumbed down" the exam, an interim report by the Qualifications and Curriculum Authority (QCA) found. Meanwhile others saw the reduction in content as a "positive move in terms of helping all students to succeed", the report said. The QCA reformed maths A-level in 2003 after exam entries slumped. The report stressed that cutting the subject content was the most controversial issue among teachers. Its report also identified a "clever core" of students who were dominating the subject in the sixth-form. While the number of A-level maths students has fallen by 7,000 in the past five years, the number of A grades has risen by around 3,500, it found. At the time of the reforms, the QCA denied it was making the exam easier. But this report into the state of the subject found large numbers of teachers disagreed. "There is a split in the opinions of teaching staff about the role of A-level mathematics and also in their reactions to the new specifications," it said. "The split does not seem to be easily reconcilable." It said one group viewed moves to make the subject "more accessible" as an "unacceptable 'dumbing down' of A-level mathematics" which made it "something that makes it unattractive to their very able students". This group of teachers see it as a subject where "the maintenance of a high level of demand and wide scope of content are paramount", the report said. However, other teachers found the reduced content gave them more time to cover material. The report concluded there is not likely to be a "middle way" between stretching the most academic pupils and attracting less able ones. But it added it was the less able students who must "most be appealed to" if the A-level is to "significantly" increase its participation and achievement rates. 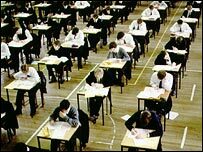 The study also found pupils dropped maths because of bad experience at GCSEs and because of its daunting reputation at A-level. Boys were more likely to value it as a useful A-level subject and girls to be concerned whether they could cope, researchers said. The QCA insisted the reforms made the subject "more flexible" but not "easier". It also pointed out this was an only an interim report and the changes would continued to be looked at over the next 18 months. A QCA spokeswoman added: "We do recognise that post-16 participation in mathematics is a cause for concern and we are looking to understand why that is and what we can do to improve this. "But we will not do that by dumbing down mathematics."